The magnificent Blue whale is the largest animal on our planet, ever. The longest recorded length for a Blue whale is over 100 feet and they are sought after by whale watching groups around the world. It has a long, somewhat tapered and streamlined body, with the head making up less than one-fourth of its total body length. The rostrum (upper part of the head) is very broad and flat and almost U-shaped, with a single ridge that extends just forward of the blowhole to the tip of the snout. The body is smooth and relatively free of parasites, although a few barnacles may attach to the edge of the tail fluke, the tips of the flippers and to the small, triangular dorsal fin. There is a row of 300 to 400 black baleen plates on each side of the mouth, and approximately 90 throat grooves extend to the navel, which allows the throat to expand enormously during feeding. Despite its common name, the Blue whale is actually grayish-blue, with a mottled effect that is visible in some lights and can allow individuals to be identified. The underside often has a yellowish tinge, especially on whales living in polar waters, which is caused by microscopic algae called ‘diatoms’ and led to early whalers giving this species the nickname ‘sulphur bottom whale.’ The blow or spout of the Blue whale is the biggest among all cetaceans, the slender column of air when the animal exhales can reach 30 feet . The Northern Hemisphere's Blue whales are generally smaller than their cousins in the Southern Ocean and the females are much bigger than the males, perhaps by up to 30 feet. Despite their awe-inspiring size, we know little about this amazing animal. No footage has ever been recorded of the Blue whale mating or giving birth. Scientists know very little about where these cetaceans go to breed or raise their young. 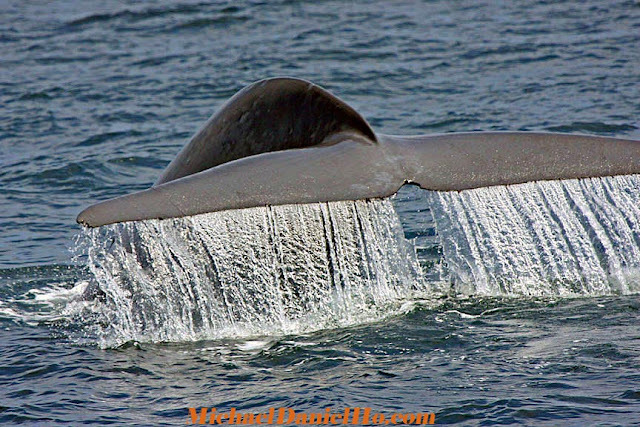 Photographing Blue whales is one of the most exciting thing any photographer can do. The immense size of these animals are simply stunning. Yet they are so gentle and calm even among ships and boats in a busy traffic sea lane like the Santa Barbara Channel in California. Visit my website MichaelDanielHo.com to see many more Blue whale photos from around the world and follow my travels on Facebook.